By David B. Agus, M.D. Can we live robustly until our last breath? – Michael Dell, Founder, Chairman, and Chief Executive Officer of Dell, Inc.
“Dr. David Agus is surfing the crest of two great waves of innovation -- in information technology and the life sciences. His End of Illness uses Big Data to decode the personal and molecular basis of disease. And, more important, advance a new model for health where prevention is key. "David Agus, one of the nation's most innovative cancer doctors, shatters the myths about health and wellness and provides us with a handbook for living a long, healthy life." David Agus is one of the great medical thinkers of our age. 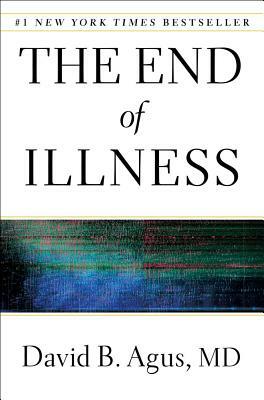 "The End of Illness" reframes the entire discussion of sickness and health. Instead of thinking about disease Agus thinks about the system that is the human body, and what we need to do to guide it toward health. Before you take your next vitamin, read this book.